I haven't read this many teen and junior fiction books in a row for quite some time. It has been a lovely holiday from my recent fare of epic classic chunksters and thought-provoking non-fiction. 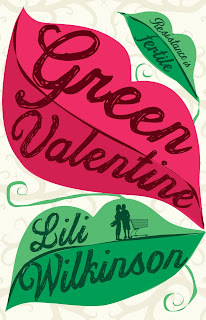 And Green Valentine by Lili Wilkinson has summer holiday read all over it. This is a romantic romp with a great big environmental heart. This is the kind of teen fiction I would have lapped up in my day - I've always been a sucker for a nobody-puts-baby-in-the-corner ending! I was never an alpha-girl at school, but I was one of those annoying superior girls-with-a-cause, like Astrid. In my teen years, the hole in the ozone layer was just being discovered and discussed. As a result, I converted my family to non-whitened toilet paper, embraced recycling, stopped using aerosol containers and moved to green cleaning products. I even went through a phase of making my own paper and using old magazine pages to make my own envelopes (you know, back when, we actually wrote letters to our family and friends)! All this is to say, that Wilkinson has created a very believable character in Astrid. The romance is just right for the age group this book is aimed at (14+) and the teen dialogue is snappy and fun. The adults are a little one dimensional, although I guess that's how many teens view anyone over the age of 25! I'm a fan of Wilkinson's teen books (her mother is Dragonkeeper writer Carole Wilkinson) and have just spotted that her first book was one about Joan of Arc. I hope it's still in print. I've seen this cover around quite a bit, but didn't really know anything about the book, or the author (and had no idea of her lineage). I have a fascination with Joan of Arc- my library has an audio version which I've requested to come from another branch. BTW I so wish I could join in on your Being Mortal read along this month. It's in the house... I am hoping to get to Gut though. Being Mortal is more anecdotal than we thought it would be, but that makes it easy to read. I've also learnt not to read it in public places - being caught out twice nearly blubbering my eyes out!